Tales of Symphonia is one of my favorite GameCube games that I played when I was kid. I don’t remember it all too well now, having not gone through it for many, many years. But I do recall something silly I did with it. Thinking back on it, it was not a good move to do that at all. It wasn’t even necessary. But I liked the game so much, I didn’t care. It gave me an excuse to play the opening sections again and enjoy the experience once more. Tales of Zestiria the X instantly reminded me of Symphonia for obvious reasons. Sadly, I won’t be remembering Zestiria quite as fondly. Zestiria begins shortly where the prequel episode left off. Alisha finds herself within a set of ancient ruins dedicated to the fabled Shephard. Upon “discovering” a secret alcove and running into Sorey, a young boy living among the Seraphim, destiny’s wheels start to churn. This anime is based on a very popular video-game series known as the Tales of franchise. Each game (more or less) features a group of likely heroes, a fantastical setting, and an adventure to take out some great evil. Furthermore, each story is different. The cast and the plot change with each iteration without much (if any) crossover between them. Zestiria follows this formula, too. 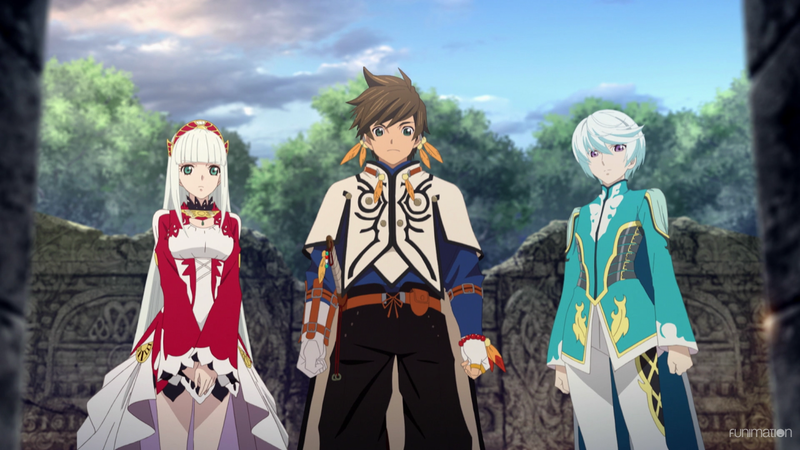 Alisha, Sorey, Mikleo, Lailah, Edna, and Rose join forces in a world filled with dragons, magical transformations, and a capital city sprawling with festivities. Their fights against monsters, the idea that goodness prevails over evilness, and a plethora of otherworldly elements turn the anime into a common yet classic fantasy adventure. As they traverse the land, Zestiria focuses on a major plot point that ties into one of its biggest themes: Malevolence. What creates these monsters and causes the townspeople to succumb to sickness are negative emotions. Anger, hatred, envy. Such thoughts, such Malevolence, seep into the very fabric of the world and its denizens, summoning forth hellions (the anime’s word for the demons), inciting mean-spirited-ness and restarting the cycle anew. The show depicts this in various ways. A hidden antechamber filled with the souls of executed prisoners. Men turned into hellions due to conflict and despair. Wars fought with only bloodshed in mind. The severed connection between humans and Seraphim also gets at the overabundance of Malevolence. Because people have lost sight of goodness, the Seraphim remain unknown to almost everyone. Mikleo will sometimes comment as such, and Lailah warns Sorey of the difficulties he will face at the hands of purging human-bred Malevolence. Regardless, the anime makes it clear that negativity breeds more negativity, and the only way to stop it is for righteousness to reign. Zestiria has enough there to start it off on the right path. The fantasy structure, the Malevolence motif, and the mixture of the two give it a solid (albeit tried-and-true) setting. Unfortunately for the anime, way too many problems prevent it from following that path correctly. Its most obvious blunder occurs during the middle of its run. After the first four episodes, once Sorey officially (and expectedly) becomes the Shepherd, and right after a cliffhanger, the anime spends two episodes on an entirely different plot. That is, a completely new iteration of the Tales of series, entitled Tales of Berseria, takes the focus. 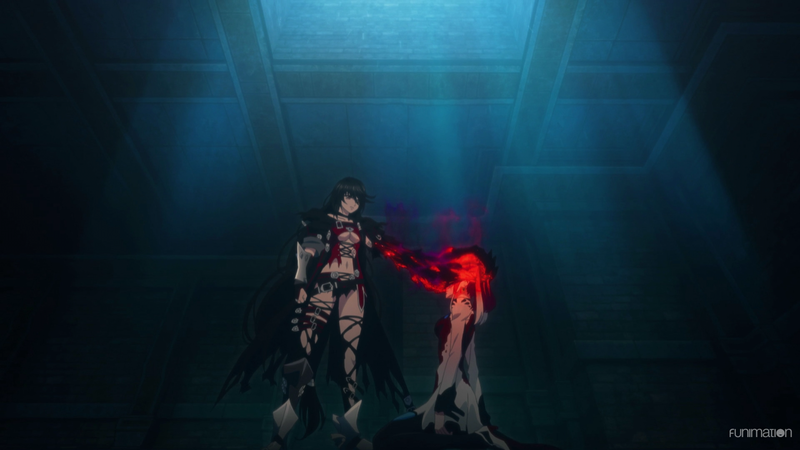 It follows a woman named Velvet Crowe as she escapes from prison with the plan to avenge her younger brother who was murdered before her eyes. This diversion would have been at least warranted had the anime afterwards referenced these episodes. But it doesn’t. From the events depicted to the characters themselves, what happens is never mentioned again. It would be as if, in the middle of Harry Potter and the Chamber of Secrets, the story spent forty minutes on a set of characters named John, Mark, and Tammy as they go to the wizarding school of Pigblisters, only to have them and their exploits never talked about or shown again. It has no relevance. It breaks continuity. And it is downright unacceptable. Disregarding these two episodes, Zestiria’s narrative has its own problems. The biggest being something fundamental: what actually goes on. In essence, the anime is a bunch of random quests strung together that lack any worthwhile connection. Sorey and the others move from location to location, performing singular tasks that either don’t lead into the next in a plot-related fashion or aren’t resolved at all. It makes the story feel both disjointed and without a clear sense of direction. The anime does its best to have a couple of goals. One is that Sorey will visit the different Shepherd ruins around the world as he cleanses the Malevolence. The second is that he will try to reestablish the connection between humans and Seraphim, finding clues at said ruins. But neither goal is tackled in a meaningful way in this first season. The set of dragon episodes is particularly egregious. Not only does Sorey’s trek to defeat the dragon nesting there end in failure, but it introduces a random character that does not appear again. Plus, the dialogue devolves into the same “no dragons have ever been returned back to normal” (or something similar) phrase. Edna at least joins the party, but any other set of events could have happened, and the outcome would have been the same. Speaking of the party, the anime has trouble here, too. Sorey and the group are almost never all together. Alisha is forcibly summoned, Mikleo goes off on his own mini quest, and Rose doesn’t officially join until this first season’s conclusion. Without a solid, stable group, one of its own key fantasy elements – a full cast of heroes – is lost the whole way through. There’s also the main-villain reveal and how oddly its handled. He just shows up. Partly because of all the Malevolence floating about the battlefield, partly because the anime realized it needed a proper antagonist of some sort. His whole going-to-crush-Sorey-at-his-peak does make some sense since, by crushing Sorey (and as he similarly puts it), he would then also destroy the epitome of hope. However, it’s a very sorry excuse to let Sorey continue on in the story, and it stops these two from adequately forming a good-versus-evil relationship. On top of the anime reducing the importance of the trickster in favor of the spectacle, the anime forgetting about the old-man Seraphim, the missing build-up to the war, and the final bit of “drama” with the Malevolence-driven general, it’s clear the story has troubles. But, realistically, that Tales of Berseria diversion did enough harm on its own. 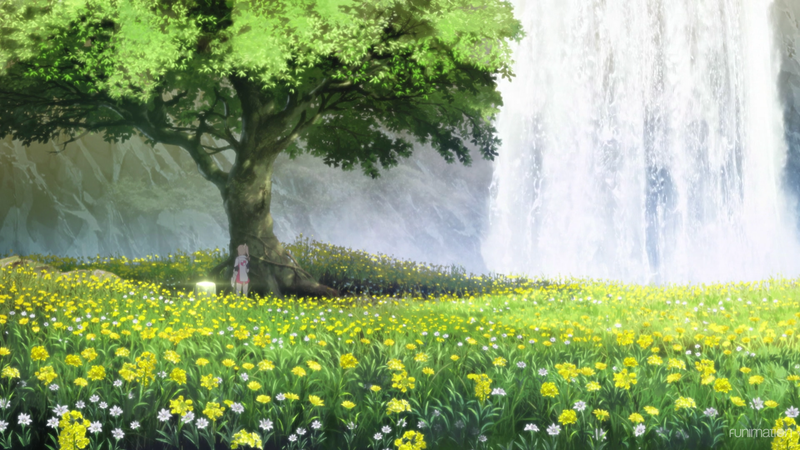 Zestiria is quite the beautiful anime. Often, it will take the time to show off a scenic landscape: Sorey standing at the edge of a cliff looking out at a setting sun and colored sky, Alisha walking through a green grove caressed by the mist of a waterfall. It gives the show the fantastical feel that it strives for by giving the audience a sprawling bunch of picturesque places. Unfortunately, many of the locations aren’t given their just detail. Open plains, rough mountains, and other scarce spots provide ample working room for the cast to battle. But these less-than-interesting backgrounds make the audience yearn for the more majestic shots that the show has shown it can produce. The biggest exception being the capital of Lady Lake. Its festivity-filled plaza, the myriad of people lining the streets, and a royal castle make it the only area in Zestiria that always aims high. Even so, it’s very hard to deny the various degrees of lighting, the sharpness of each shot, and the lack of any noticeable visual mishaps. It’s without argument a pretty show through and through. Moving on but not without relation, the character designs are similarly strong. Alisha’s design is quite nice with her white-and-pink armor, side ponytail and curls, and sparkling green eyes. Edna goes for the cute look: short boots, charming umbrella, and multiple accessories like a choker and a hairband. Actual animation also remains high in quality throughout the entire season. Not just in flowing hair during high winds or blinking eyes when they speak. But where it matters most: the fight scenes. 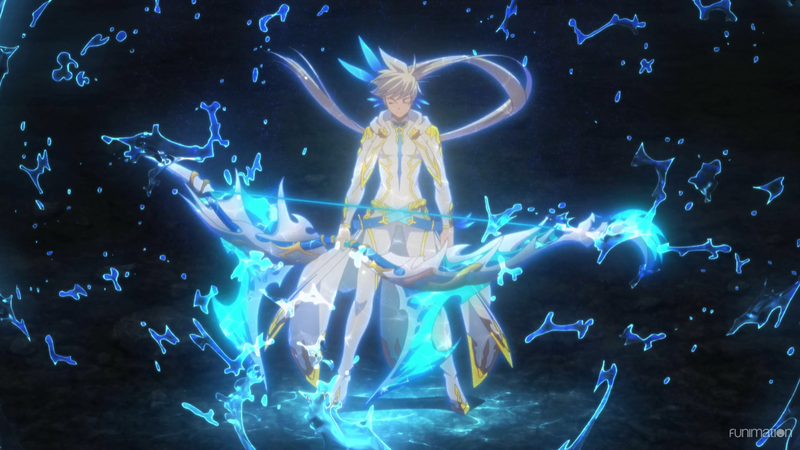 The multitude of magics used, Sorey’s highflying acrobatics, and even the different CG uses blend together to create flashy fights with enough explosions and pizzazz to wow anybody. To be fair, Zestiria has perhaps one-too-many sitting-and-or-standing-while-talking segments that do not invite a whole lot of dynamism. Still, the cleanliness of these downtime shots, and what the show offers when it does pick up, make up for this avoidance of movement. Two final points. One positive and one strange. The positive is the previews for each episode. Sorey and the others face the audience in a “two-dimensional” fashion with predetermined reactions. These small segments match the dialogue ones from the main games, adding to the overall charm of the show itself. The strange is the ending track’s visuals. It shows all the members of the cast hanging out and having fun as separate pairings or groups. It’s misleading since such interactions are rarely shown between those depicted, let alone the anime showing them all together at once. Perhaps it implies that they will all, in fact, eventually be together. But, for now, they’re not, so it’s an intriguing decision to show them as such to say the least. 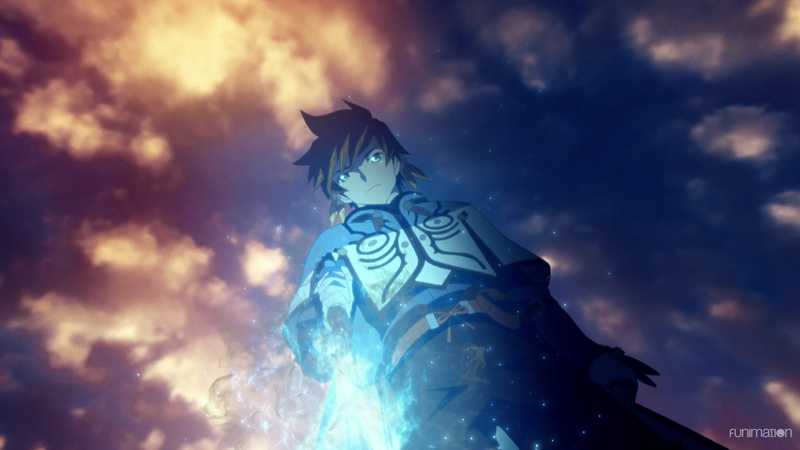 While Zestiria’s art and animation step up its game, its characters bring it back down. The biggest issue of the bunch being Sorey. The anime establishes him as a plain, kind, and straightforward man. Not an issue. For that’s what makes him the Shepherd of his age. A person capable of uniting both the people and the Seraphim through his righteousness and purity. No, what makes him a weak character is how he becomes who he is. Not the pulling-the-sword-from-the-stone event which arguably marks his best moment. It’s what the anime does – or more precisely doesn’t – to build his foundation. Sorey’s knowledge of all-things Shepherd is excused by the village he grew up in and the book that he practically read about one-thousand times. Problem is, his childhood is never shown, let alone him interacting with the other Seraphim. And already having all the knowledge necessary to tackle the path before him, as though it was gained by default, makes said path a rather easy one. In other words, it’s odd to see him just inherently know or understand everything about being a Shephard. Sorey simply just does it without awe, questioning, or issues. He knows how to fight using weapons and acrobatics. He knows the rituals to make pacts. He knows the ins and outs of his situation. It’s even odder when one remembers that he has been kept away from humans for almost his whole life. So, when he has little to no worries as he walks around, dealing with the problems and newness of it all in stride, it reduces roundness of his character that much more. To be fair, he does grow more powerful as the Shepherd by not needing to dull his senses so that Alisha can gain an audience with the Seraphim. And he learns more about the world he never knew such as with the Malevolence that permeates everywhere. But the former is not exactly the best indicator of his growth since it just naturally happens and, indeed, does not have the same level of importance as, say, his skills or his own conflicts. And the latter doesn’t actually change his mindset. In fact, it only hardens his resolve to continue his goodness. Expected but uninteresting. Altogether, Sorey has no backstory. No chances at personal growth. No anything. He just accepts it all, so the audience must as well. Again, and arguably, he’s the Shepherd, so perhaps it’s required that he is so conveniently suited for this job. The show isn’t some dark, twisted drama that demands the utmost realism. Indeed, it’s a fantasy adventure with a nice guy at its helm. Meaning, it’s okay if Sorey is bit on the flat side. Even if that’s the case, since the anime gave him a personality, gave him a big group of friends to travel with, and gave him this opportunity, more should be had. Plus, a story is being told and presented on its own, so needing a strong protagonist is not something crazy. Many of the others fair just as miserably. For example, Mikleo boils down to a single phrase: “Sorey!” No matter how close he is with his best friend, Mikleo shouts out Sorey’s name way too much, turning him from a worthwhile sidekick and into a broken record. Zestiria tries to give him his own purpose through an ancient-artifact-acquisition side-quest. But, since the trek has no conflict for him to overcome besides walking far, all it does is make him a broken record that also wields a bow. Edna does not appear until the halfway mark of the season. She’s a bit snarky, but she has her heart in the right place. Her main conflict revolves around a rogue-brother-turned-dragon. However, the miniscule flashback she gets and the anime not incorporating her appropriately beyond her introductory episodes puts her in a valueless spot. To the point that she essentially becomes the cute sidekick that occasionally says mean-yet-playful words. Lailah had been waiting at Lady Lake for the Shepherd to appear and, when Sorey did, she joined his cause, believing in him and his actions. In essence, Lailah is the guider. A teacher of sorts that looks out for all of them. That, is, she is purely a support character (at least for now) since almost nothing else is known or learned about her. She has her niceness and her very occasional cute moments, but next to nothing noteworthy. An overall neutral character. That leaves Rose and Alisha. Arguably speaking, they are the strongest characters that Zestiria crafts. Quoted because that business is not selling goods but rather killing royalty. Now, while it’s already known or at least incredibly obvious that Rose and her troupe are the assassins hired by Alisha’s governmental enemies (thanks to the prequel episode and the not-so-subtle tells), it stands as an interesting character detail. Alisha’s “policy of non-aggression” is something many of the higherups do not agree with. Same for Rose. So, they and she take it upon themselves to counter Alisha’s initiative. Sadly, Rose does not appear for a long while. Not until the village that Sorey and the Seraphim saved. There, she goes from enemy to friend, signifying her change in position with Alisha. Granted, her transition was underwhelming. Alisha just says a few words to convince Rose, and the whole double-walking-away-all-cool-like isn’t the grandest of ways to end their conversation. But at least she converts and proves her newfound thinking by helping Alisha and going with Sorey as the first season concludes. Alisha is arguably the best character of Zestiria. In her own words, “I, Alisha Diphda, absolutely forbid vengeance.” To her, maintaining honor and doing what’s right, even if that means losing or succumbing to attacks, takes precedence over everything else. This makes her out to be a strong leader – with many an enemy. Like Rose, she proves herself through her actions. Given her status, she does not have to do anything. Yet she takes it upon herself to uphold her ideals. She includes the sword-pulling ceremony to inspire hope in the people. She tends to the sick and the weary miles from the safety of the castle. She leads the brave men and women that follow her into war. Despite her stalwart personality and grounded thoughts, she, more than any other human, believes firmly in the legends. Of the Seraphim that light this world and the Shepherd who will one day save everyone from calamity. How fitting, then, that much of her character centers on the Seraphim. Stumbling accidentally into their home, reading the same book as Sorey growing up, and slowly but surely interacting with Mikleo and the others like him. All of which culminate into the best writing moment in the whole season. After becoming a Squire of Sorey’s through their pact (earning the true name “Smiling Alisha”), she finally gets to see the Seraphim with her own eyes. While she always knew of them and could even hear them, viewing them in front of her made for a nice scene and capped off her character well enough for the season. It’s unfortunate that many of the other characters were not handled similarly. Especially Sorey. But, hopefully, the second season takes to correcting these issues. The opening track of Zestiria is a bit stronger than perhaps at first perceived. It mixes together many different instruments: guitar, bagpipes, violin, drums, shakers, chimes. They don’t overpower one another. In fact, they do well in supporting the vocalist as he moves from empowered yelling to reserved singing. While the track itself is not the catchiest around, its small flourishes in pace and tune – like with the dancing violins in the middle, the harmonizing in the second half, and the faster lyrics near the end – place it in a nice spot. The ending track is much slower, using such pacing to deliver a slightly happy tune. It aims for a more emotional level with its higher vocal ranges and heavier reliance on piano and violin. This direction is especially evident near the song’s conclusion when everything comes to a crescendo. Again, not the most memorable of pieces, but it’s still a solid track nonetheless. The original soundtrack does a lot to build Zestiria’s atmosphere while maintaining that fantastical feel. A mysterious tune filled with plucking harp strings. Choir sections for those tense or victorious moments. Fanciful flutes so the downtime feels that much more relaxed. Arguably speaking, the OST comes out as the winner of the musical offerings. Sound-effects are on point, too. Dragons bellowing loudly, Sorey firing an arrow, the clashing and clanging of armor. Alongside the calamitous sounds of a raging tornado or of a torrent of rain, the anime fills the air with a myriad of sounds that reinforce the different encounters and scenes with ease. Lastly, there were no notable voice-acting performances. This one falls somewhere in the middle for me. Mostly due to the characters. Sorey is a cool dude, but he is much too plain. Mikleo means well in supporting his friend, but he didn’t do too much to capture my attention. Lailah had a cute pout or two, but she wasn’t as charming as she seemed she could be. Edna brought a bit of fun with her silly nicknames, but wasn’t given the time to say a whole lot. Rose had the most interesting background, but showed up the least. Given how this season ends, the characters may have the chance to make up for their missing intrigue. But, for now, they sit in that quasi state of likable but not really entertaining. The only character I have yet to mention is Alisha, for she is the one I consider my favorite. I liked her stalwart behavior in the face of conniving political fiends and traders-turned-killers out to get her. Moments like when she first heard the Seraphim, and her sincere gratitude towards them when they saved the village from the plague, were heartwarming to watch. 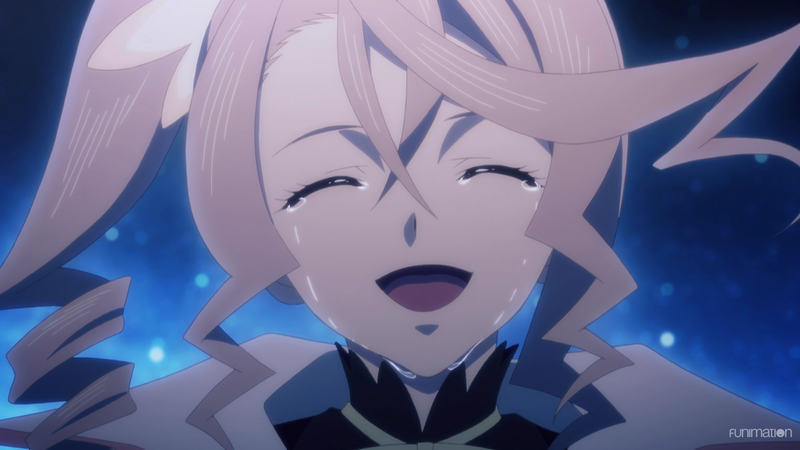 While it would have been sad for Alisha to die following the war, it would have easily made the anime more interesting on both an emotional and thematic level. But the show chickened out instead. Granted, that led to arguably the best moment in the whole season – Alisha finally seeing the Seraphim in person – but, had the show killed her off, it would have demonstrated that it wasn’t afraid to try something daring. It also does not help, though, that Alisha apparently leaves the party altogether, or at least for a long while, as she fights on her home turf in the meetings rather than in a foreign land on the battleground. Meaning, my favorite character most likely won’t be around as much as I would like come this second season. As for the fights, it was mixed. A lot of them were rad due to their shininess. Sorey and Mikleo purifying the dragon at the small village was particularly awesome. However, many of the battles were just against a giant baddie (a transparent beast, a giant river worm), so they missed out on nuance and variety. It’s what made Rose and Alisha’s fight against Alisha’s countrymen the most interesting because Rose’s martial-arts moves actually gave something else besides the magic. And so, all in all, while I wish the best for the anime, I don’t see myself picking up its continuation anytime soon. Tales of Zestiria the X already has one strike in its title but chose to earn a few more throughout its run. The art is enticing, but the story’s interruption makes no sense, and Sorey is a tame protagonist. As far as can be remembered, it’s an “Eternal Apprentice” until proven otherwise. I didn’t mind this anime. I hadn’t played the game and the two episode advertisement run mid-season was a bit of a downer, but it was kind of okay fantasy. Definitely not without issues but not unwatchable either. And I’m getting mixed reviews about it, too. Some are saying to check it out. Others are advising me to stay away. No matter what, though, it’s interesting to see so many resources pooled into it. It no doubt has a lot of fans out there! It was quite the strange narrative move. Been a long time — if ever — that I have seen a show (or film or something similar) just completely shift gears onto a brand new story *mid* story, only to never reference the new one again. > Definitely not without issues but not unwatchable either. If nothing else, the anime is pretty to look at. Those fights and the scenic shots in general went a long way towards making the whole experience visually pleasing.